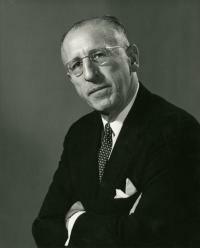 On February 18, 1971, the Bellevue Hospital Medical library was named for, and dedicated, to Dr. Clarence E. de la Chapelle. The honor was bestowed on this noted bibliophile in recognition of his service to the Bellevue House Staff through his years of guidance and devotion to the Medical Library. De la Chapelle also served for many years as the chairman of the Medical Library Committee. In 1983, de la Chapelle endowed the NYU Medical Library Archives in memory of his late wife of 51 years, the former Lillian Buckmann. This endowment has allowed for the acquisition, description and conservation of invaluable documents, letters, and historic records relating to the history of the school and NYU Langone.